Bone stress injuries occur on a continuum, beginning with a stress reaction, followed by stress fracture and eventually to a complete bone fracture if the stress factors persist. Progressive structural fatigue failure of normal bone occurs in response to excessive repetitive loading. This is contrasted by insufficiency fractures, where already weakened bone fails in response to normal biomechanical stresses, such as in osteoporosis. Bone stress injuries of the ankle and foot typically occur in the young active population, with military recruits, runners and dancers strongly represented. Not surprisingly, some 80% of all stress fractures involve the lower extremity. While any foot bone can be affected, metatarsal stress fractures dominate. The metatarsals account for 23% of fractures in athletes and between 10% and 20% in military recruits. Furthermore, the second to fourth metatarsals are affected in 80% to 90% of cases. This is considered to be due to these metatarsals sustaining increased loading forces, that is related to the firm ligamentous anchoring between the metatarsal heads. In runners, a change in running frequency, duration or intensity, along with too rapid change from traditional thicker-soled shoes to minimalist/barefoot running shoes have been implicated. 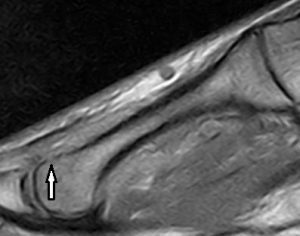 Of the imaging modalities for evaluating stress fractures, MRI is regarded as the method of choice due to the ability to evaluate soft tissues and its superior anatomic detail compared with X-rays. Apart from there being no ionising radiation with MRI, it is also a sensitive and specific type of study. Scintigraphy (bone scan) is also sensitive, however it is not particularly specific. X-rays do not usually reveal a bone stress-related abnormality when obtained within the first few weeks of the onset of symptoms. • Grade 1 – mild-to-moderate periosteal oedema on T2-weighted images, but no focal bone marrow abnormality. • Grade 2 – significant periosteal oedema and bone marrow oedema on T2-weighted images. • Grade 3 – moderate-to-significant oedema of both the periosteum and marrow on both T1-weighted and T2-weighted images. • Grade 4 – low-signal fracture line on all imaging sequences and significant marrow oedema on both T1-weighted and T2-weighted images. Also, possibly significant periosteal oedema and moderate adjacent muscle oedema. Fluid sensitive MRI sequences, such as short tau inversion recovery are also very sensitive for both endosteal marrow and periosteal oedema. 1. Moderate marrow oedema of the distal half of the second metatarsal mainly centred at the second metatarsal head. 2. 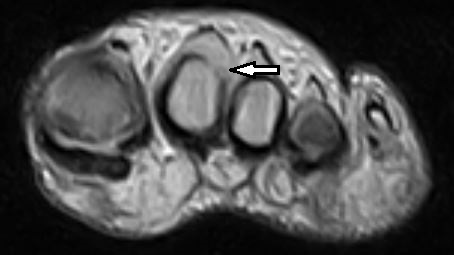 A faint hypointense T1 line and mild cortical irregularity/step defect seen in the head of the second metatarsal, suspicious of an undisplaced fracture. 3. 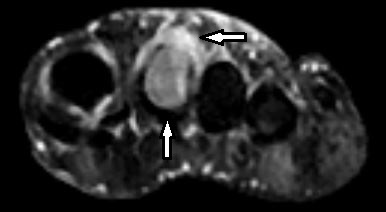 Moderate soft tissue oedema around the second metatarsal shaft as well as over the dorsal aspect of the foot from the first/second to the fourth/fifth intermetatarsal space. If we can be of assistance with foot imaging, contact us on 03 9592 3319. Brockwell J, et al. Stress fractures of the foot and ankle. Sports Med Arthrosc Rev 2009;17(3):149-159. Burge A, et al. Imaging of sports-related midfoot and forefoot injuries. Sports Health 2012;4(6):518-534. Chuckpaiwong B, et al. Second metatarsal stress fracture in sport: comparative risk factors between proximal and non-proximal locations. B J Sports Med 2007;41:510-514. Kindred J, et al. Foot injuries in runners. Current Sports Med Reports 2011;10(5):249-254. Shindle M, et al. Stress fractures about the tibia, foot and ankle. J Am Acad Orthop Surg 2012;20:167-176. Warden S, et al. Management and prevention of bone stress injuries in long-distance runners. J Orthop Sports Phys Ther 2014;44(10):749-765.